I managed to eek out one finish for Q3! I was determined to have something to cross off my Q3 Finish-a-long list, so this weekend I basted, quilted and bound my mega log cabin block quilt. Back in 2009 I created this quilt (and here) for my sister and her new baby. I had a fair amount of the fabrics left over, so I always kept them stacked together. Then last year I wanted to try making up a mega block quilt (a quilt top made from 1 over-sized quilt block), so I grabbed my stack of fabrics and went to town. I wanted the quilt to be soft and drape nicely when complete, so I quilted 1" horizontal lines over the quilt. It crinkled beautifully after I washed it! Working with this quilt again has inspired me to make more mega block quilts. Maybe stars up next? **Update - This quilt is now listed for sale on my Etsy store site. Quilt Finish #2 for 2014! I love how my version of the Economy Block Quilt came out using fabric from Jack and Lulu's All Hands on Deck collection of fabrics for Dear Stella. I had a lot of fun fussy cutting the seagulls, sailors, and boats, and I learned a lot paper-piecing the blocks using Rita's (Red Pepper Quilts) tutorial and template. I quilted this one on my home machine by echoing the diagonals formed by the diamonds. It is backed and bound with fabrics from the same collection (the crabs were my favorite). The quilt is 34" x 41" and was listed in my Etsy store, but has now sold. I must also mention that this is finish #2 on my Q1 Finish-a-long list. I only managed to finish 2 out of 6 this quarter. Here it is: my first finished quilt for 2014! This was another impromptu quilt-along that was fueled with lots of pictures from Flickr. I had this quilt long-arm quilted by Plain Jane and I love the way the interlocking bubbles turned out. The quilt is 67 in. x 53 in. which makes it a "throw" quilt in my book. I backed it in fabric from Zen Chic's Comma collection for Moda, and bound it in Glacier Kona Cotton (which is richly dark teal if you can't tell from the photos). ONE finish done for my 2014 Q1 Finish-a-Long. Yay! This quilt is listed for sale in my Etsy shop. This year I joined an online quilting bee that is focused on making improv blocks (blocks that don't follow a strict pattern). You can see a few of the bee blocks that I've made here, and the group's Flickr page here. We decided that our project for December would be a mini-quilt swap. We were blindly assigned partners from the group and set out to make them mini-quilts and few fun "add-ins." I found my partner's Pinterest page and was able to see recent quilt pics that she had pinned: some of which were "Polaroid Block" quilts. Just a few weeks earlier another group member, Mandy Leins, made a polaroid quilt for Quilt Market. Between the pictures of Mandy's quilt and the Polaroid quilts I was seeing on Pinterest & Flickr...I knew I wanted to make one for my partner. Plus I had a TON of holiday fabric scraps from making fabric gift bags through the years that were going to work perfectly for fussy cutting. To make the Polaroid blocks I followed this tutorial, and then added more negative (red) space around each block. Once I had the blocks done, I put them on a random angle and trimmed them all to 6 1/2" square (including seam allowance). I didn't really have a plan for the size of the quilt when I started out; I just picked fabric scraps, "fussy cut" images for the Polaroids, and then started making the blocks. Once I had all my blocks made, I laid them out several different ways and settled on a "big-mini" (wall-hanging?) quilt size. In the end I used 35 of my Polaroid blocks. The quilt is roughly 42" tall and 30" wide. I used Kona Cotton's "Rich Red" for the background and bound it in a green & white stripe from Me & My Sister Design's "Ready, Set, Snow" collection for Moda. I backed the quilt in this fun multi-color "Yonder Star" fabric from Alexander Henry, quilted "in-the-ditch" on the inside and outside of each Polaroid, and then added hanging pockets. Now it's time to send it off. My fingers are crossed that my partner likes it! I'm happy to have another quilt finished! All the fabrics used in the quilt top were found in my stash: various Kona Cotton solids in shades of green and "rich red." The white fabric is some mystery fabric that I found in my cupboard. I backed the quilt in a red and white print from Susan Lynam Clough's "Black Tie Boogie" collection for Red Rooster Fabrics. I treated myself to having the quilt long-arm quilted by Plain Jane Quilting, and I love how it the "meandering loops" pattern turned out. I wanted the quilting to look like blustery wind and blowing snow. I also had her quilt-in-the-ditch around each tree and around the red borders. The quilt is 64 by 55 inches and is my third finish in my Q4 Finish-a-long! I decided to keep the quilt for myself and am looking forward to much snuggling under the quilt this holiday season. I had a helper with my photo shoot today! This was a commissioned quilt and it was requested that I made a chevron quilt that didn't have any yellow, didn't use any flowery or childish prints, included turquoise & gray, and matched an accent wall in the bedroom where it will live (hence the mushroom background color). The customer also requested random pops of orange. The finished quilt came in at 110" x 110" prior to a final washing and is by far the biggest quilt I've ever made. It is comprised of 324 six-inch half-square triangles. The backing fabric is Kona Mushroom and there are around 36 gray, lt. blue, dark blue, turquoise, purple and orange prints used from too many collections to name. Most of the prints were tone-on-tone or white-on-tone. I don't have a great shot of the finished quilt backing, but I included rejected blocks from the quilt top and arranged them in to pinwheels - or windmills. The quilt is headed to the house of a farmer, so I thought that would be appropriate. I opted to quilt vertical lines through the points of the chevrons. I wanted to break up the strong horizontal lines from the pieced pattern in the quilt top, but not add too much to a quilt top that was already very bold. I bound the quilt in multicolored scraps from the quilt top. When it came time to make the coordinating euro shams, I struggled to come up with a design that wouldn't clash with the chevrons but would still stand out. I decided to do color-blocked circles. I backed the pillows in an ikat polka dot home decor weight cotton/linen blend from Premier Prints. The King Chevron quilt counts as my second finish for Q4 in the Finish-A-Long! Two projects down, 2 to go. Last week I did a LOT of quilting and got my Scrappy Trips Around the World quilt DONE! This was part of the impromptu quilt-a-long and it was fun to see everyone's pictures in the Flickr Group. I chose to use rather traditional fabrics in my quilt, and felt that a simple, all-over, traditional quilting pattern would be appropriate: so I did orange-peel quilting using my walking foot. You can see a tutorial on how to quilt this pattern with your walking foot here. It took a while, and it is far from perfect quilting, but I really love the end results. To back the quilt, I used a fun green gingham fabric with pink flowers from Mary Jane Butter's Glamping collection for Moda (and a piece of pink reproduction fabric with kitties from my stash). 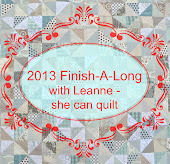 This quilt was also on my "To Do" list for Q3 in the Finish-A-Long. One done! I've been wanting to make a chevron baby quilt for along time. Cross that one off the list! I'm not sure whether I had more fun making the quilt, or photographing it at my in-laws farm in rural Nebraska. The quilt is 39" by 50" and is made from 14 different turquoise, gray, and white modern fabrics. I've quilted it on my home machine with straight horizontal stripes that are approximately 1" apart. The quilt is backed with Lizzy House's Hi-Ho Silver Pearl bracelets fabric, and hand-bound with Stof's chain fabric in dark gray from their Pure collection. This quilt is available for purchase in my Etsy store. Thanks for visiting! I'm happy to now be able to share a quick project that I made for my niece's birthday (she's known as "Baby 'Taire" in my family). For her second birthday, I made the "round bottom storage bin" on the right using this tutorial from Film in the Fridge. Note: I did not make the cute orange Jelly Cat anteater. I made the large version of the bin: the bottom is 10" in diameter, and the sides are 16" tall. For my bin I used heavier canvas fabric from Premier Prints and interfacing to give it more rigidity. Shown above, the sides are rolled over twice. Below I show the bin just rolled over one time. The Boston Modern Quilt Guild has sent out a call to the Modern Quilt Community for quilt blocks. These blocks will be assembled by the Boston Guild in to quilts for victims of the recent marathon bombing. They requested that blocks be made in the colors of the marathon: blue, gray, white and yellow. My "x and +" block will soon be on its way to MA! I'm glad to be able to help in some small way.